Breaking down the overall high cost and regulatory burden borne by businesses. Illinois’ workers’ compensation system is the most costly in the region, according to a 2014 biennial study of all states by the state of Oregon. The Oregon study compares workers’ compensation costs among states, averaged across industries, and shows that Illinois has the most expensive system in the Midwest and the seventh-most-expensive system nationwide. But what aspects of Illinois’ workers’ compensation system cause the most economic harm and job losses? What are the major cost differences among states, and what has happened legislatively in Illinois in recent years to affect the system? The major pain points in Illinois’ workers’ compensation system are: the overall cost and regulatory complications for businesses statewide; the particularly high costs for working-class industries such as manufacturing, transportation and construction; and the drain on taxpayer resources caused by government-worker claims. Read on to learn more. 1. What is workers’ compensation, and how does it work in Illinois? Workers’ compensation is a type of insurance required of employers in all states in order to “make workers whole” by replacing lost wages and paying for medical benefits for workers who are injured on the job. Workers’ compensation also provides payments for workers who suffer permanent injuries. In return for being “made whole,” workers give up the right to file lawsuits against their employers for negligence. This is a trade-off: Workers who are hurt need not worry about lost wages and medical fees, and employers don’t have to worry about lawsuits over injuries. The system is “no-fault,” meaning that injured workers need not prove their on-the-job injuries were someone else’s fault in order to receive benefits. Each state sets up and regulates its own system. Illinois’ system is particularly costly for several reasons, including: the fact that Illinois holds the employer responsible for the full cost of an employee’s injury even when a workplace event represents a tiny fraction of the injury’s cause; loopholes in medical cost controls; wage-replacement ratios that are out of line with those in other states; high settlement payments; and long wait times for both workers and businesses. Employers that leave Illinois or choose to expand elsewhere regularly cite workers’ compensation as a reason for relocation.The heavy cost of workers’ compensation is clustered in Illinois’ higher-risk, blue-collar industries, the very same industries which, according to Bureau of Labor Statistics data, have been paying lower wages in Illinois than in other states and have been hemorrhaging jobs in the Land of Lincoln. 2. How much does workers’ compensation insurance cost employers – and why does it hurt job creation? According to the Oregon study, the premium for workers’ compensation insurance in Illinois is $2.35 per $100 of covered wages, which amounts to an additional 2.35 percent cost on all covered payroll, compared to significantly lower rates in surrounding states. The Oregon rankings don’t perfectly reflect reality because they reveal what state-by-state premiums would look like if each state had the same industrial and labor make-up as exist in the Oregon economy. However, the Oregon rankings allow for an apples-to-apples comparison of how costs compare across states under the assumption that they have the exact same industries. Looking at the Oregon rankings, it is not immediately obvious why workers’ compensation is such a major issue for Illinois employers, given that at most, the average employer would save about $1.30 per $100 of payroll by moving its labor force from Illinois to Indiana. However, a 1.3 percent difference in payroll costs can be a major driver of success or failure for businesses that operate on single-digit profit margins and compete across states. Moreover, the major cost differentials are found in a few industries, and work out to much more than a percentage of payroll between Illinois and other states. Given the same industrial makeup, workers’ compensation costs in Indiana are 55 percent lower than in Illinois. However, looking just at averages is not the best way to understand the economic pain caused by Illinois’ system. For example, Marty Flaska, the CEO of Hoist Liftruck Manufacturing Inc., moved his company of 300 workers to Indiana and cited the fact that he could save millions of dollars and avoid frivolous claims. The outsized cost of workers’ compensation and the major areas of cost differential with other states are concentrated in riskier industries such as manufacturing, construction and transportation. The vast majority of white-collar desk jobs in industries such as business services, finance and technology have negligible workers’ compensation costs; there is not significant savings to be achieved between states in these sectors in which a large portion of Illinois’ labor force works. 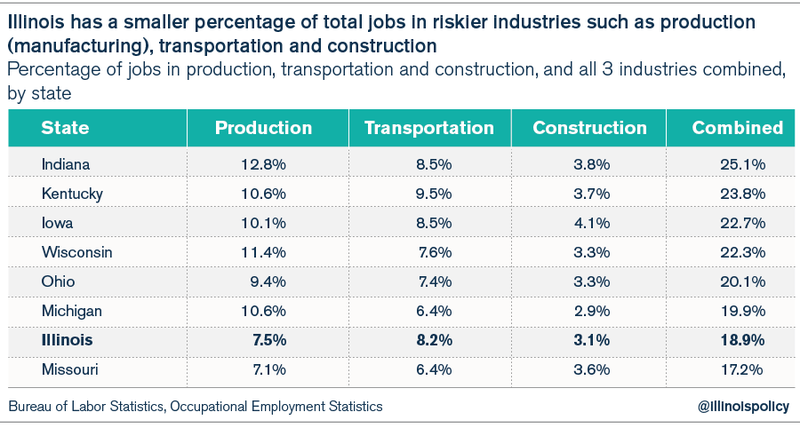 Illinois has a smaller portion of its workforce in riskier industries such as manufacturing, transportation and construction than most surrounding states. Illinois’ workers’ compensation has a disproportionate effect on these sectors, and has certainly contributed to Illinois’ losing out on new manufacturing and transportation jobs. Illinois’ workers’ compensation costs for industries such as manufacturing, construction and transportation can be three to five times more expensive than in other states. One example of a manufacturing cost comparison is for train-car manufacturing workers, insurance class code 3881. The premiums for surrounding states range from $2.90 per $100 of payroll in Kentucky and $3 in Indiana, to $12.90 in Illinois. A business that manufactured train cars would save $9.90 per $100 of payroll by moving from Illinois to Indiana. 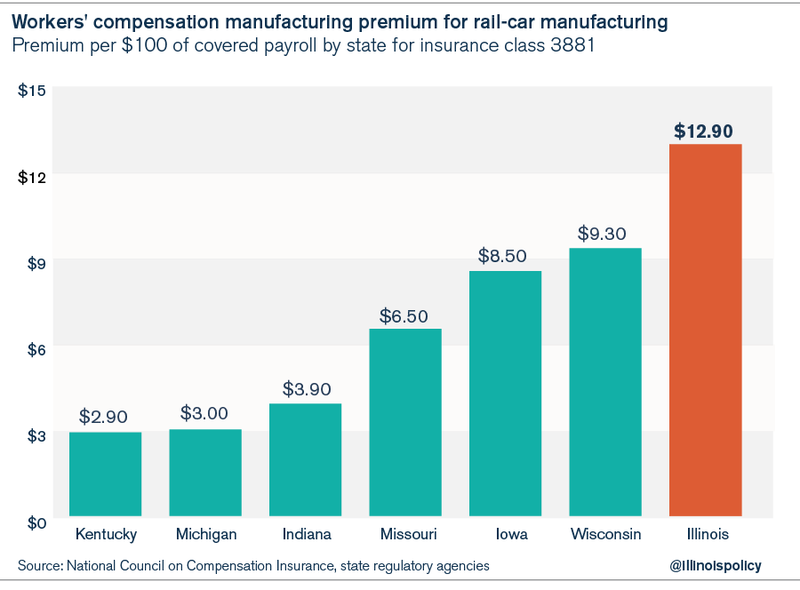 To show the impact of this range of differences, a business with 100 rail-car manufacturing employees making $45,000 per year would save $445,500 per year just on workers’ compensation by moving from Illinois to Indiana. In accounting terms, the present value of the savings a business would achieve by moving 100 manufacturing workers from Illinois to Indiana is $6.4 million in total, calculated using a 7 percent discount rate. An example from the construction trades is masonry, insurance class code 5022. 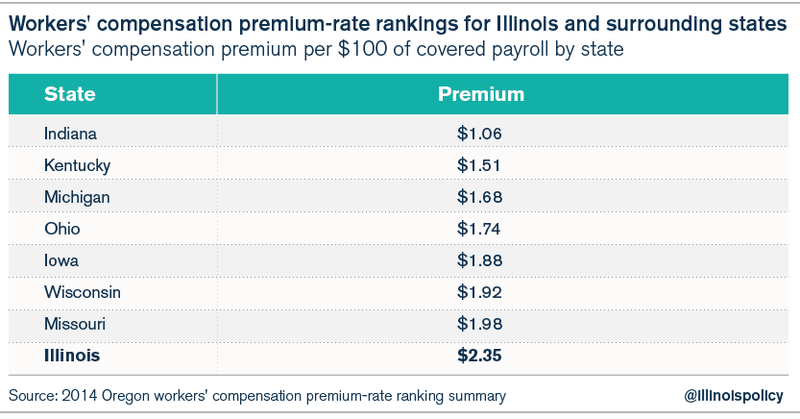 The premiums for Illinois and surrounding states range from $4.60 per $100 of payroll in Indiana to $20.60 in Illinois. In this case, a business would save $16 per $100 of payroll by moving from Illinois to Indiana. 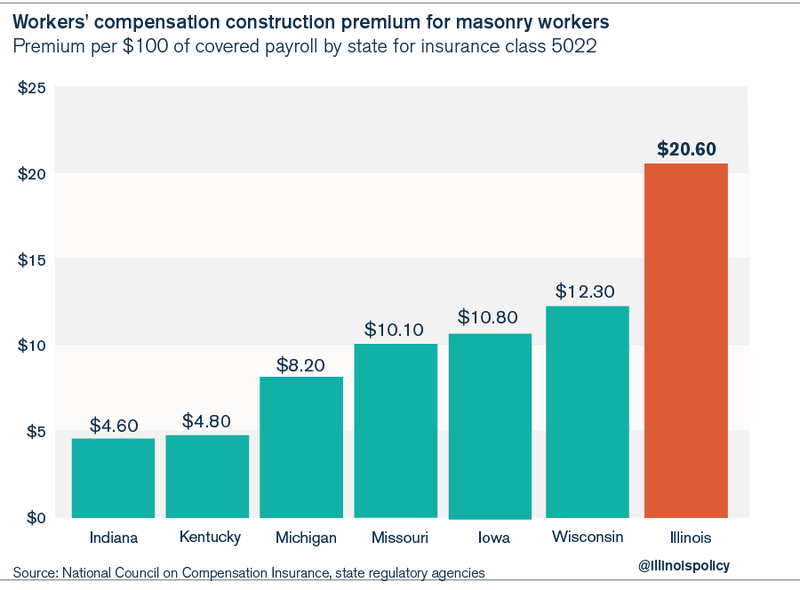 Thus, a business with 100 masons making $45,000 per year would save $720,000 per year just on workers’ compensation by relocating from Illinois to Indiana. The present value of this business savings from moving 100 construction workers to Indiana is $10.3 million in total, calculated using a 7 percent discount rate. Finally, consider the transportation industry’s truck drivers who deliver packages or parcels, insurance class code 7230. The premiums for surrounding states range from $7.30 per $100 of payroll in Indiana to $23.60 in Illinois. In this case, a business would save $16.30 per $100 of payroll by moving from Illinois to Indiana. 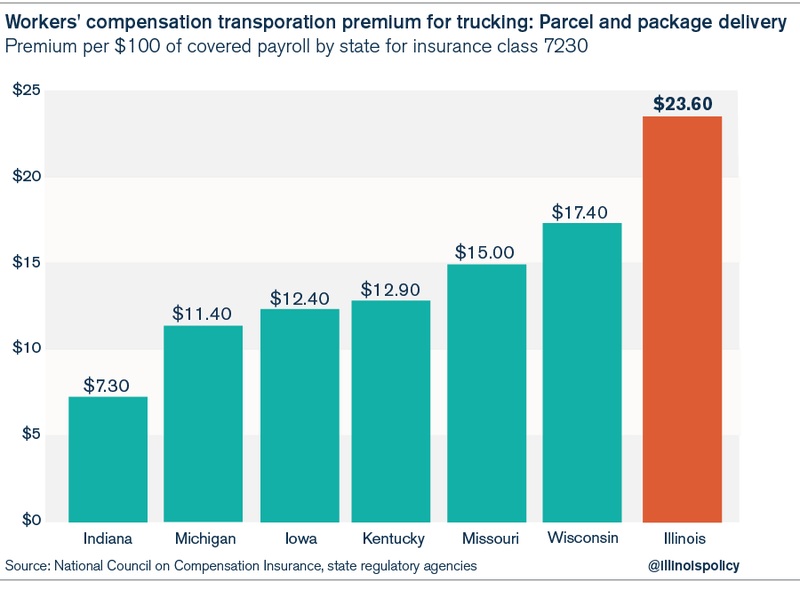 Under this scenario, a business with 100 truck drivers making $45,000 per year would save $733,500 per year just on workers’ compensation costs by relocating from Illinois to Indiana. The present value of this business savings from moving 100 transportation workers to Indiana is $10.5 million in total, calculated using a 7 percent discount rate. In short, the value to a small manufacturing, construction or transportation business in leaving Illinois for Indiana is millions of dollars in savings on workers’ compensation alone. This puts Illinois workers at an unfair disadvantage because they have a harder time keeping their jobs when Illinois businesses struggle to compete with businesses in other states and countries. Illinois’ anti-business policy is ultimately anti-jobs and anti-worker. 3. Why is reform needed, and what would it look like? A range of public figures have agreed on the fact that Illinois’ workers’ compensation system is broken, from Caterpillar Inc. CEO Douglas Oberhelman, who says Caterpillar is hindered from expanding in Illinois by the state’s current workers’ compensation laws, to Illinois Attorney General Lisa Madigan, who says it’s difficult for her to defend the state against government-employee workers’ compensation claims given the state’s extremely weak causation standard. Illinois’ unbalanced workers’ compensation policy drives out businesses and jobs, eats into the budget of nonprofits that provide crucial services, drives up taxpayers’ costs for covering government employees, and raises the cost of private and public construction projects for both individual consumers and taxpayers alike. Many Illinois companies are less competitive due to workers’ compensation alone. Workers’ compensation is a policy area ripe for reform in Illinois. Getting it right would establish fairness for both workers and employers, and would address issues such as the high cost to employers, long injury recovery times, excessive waiting times for payments to injured workers, and the unreasonable burden of workers’ compensation costs on taxpayers. A successful reform would result in more industrial investment, economic growth and job creation in the Land of Lincoln; faster payments for injured workers; hundreds of millions of dollars in annual savings for Illinois taxpayers; and an overall reduction of fraud and abuse in Illinois’ much-maligned system.